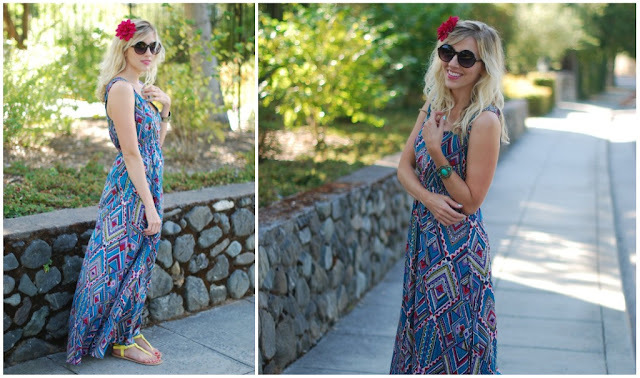 On a breezy summer day a flowing maxi dress and beachy waves are a fun combination. I love the beautiful carefree feel that this Hallelu dress exudes. As I mentioned last week, during the summer my inner hippie comes out, so a flower hair pin was a must. 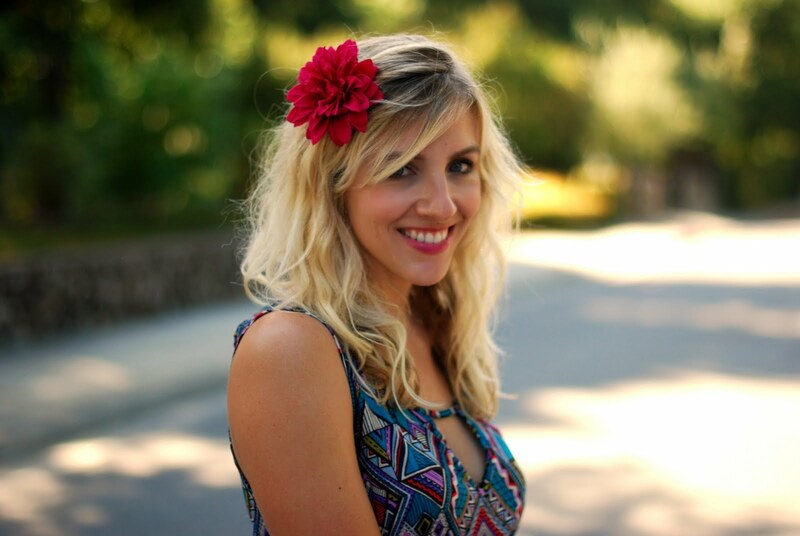 I love that flower in your hair, Taylor -- it matches your bright smile perfectly! Beautiful outfit! The flower is fabulous! Your hair looks gorgeous like this. Love that dress! Gorgeous! Lovely lovely for the summer. And I love the flower- definitely a flower child! These coulours lokk great on you!!! You look like an absolute garden goddess! The flower hair piece perfects the look. The style and colors of this dress make it perfect for the July 4th weekend. Hallelu has the cutest things! Lovely! It looks so Hawaiian Bohemian Style! I just came out of this word! :) The flower is just the right size! Very cute! Love the flower-- perfect touch : ) Happy 4th! That dress is sooo pretty! I love the colors & print, and the cute neckline! Happy long weekend, Taylor! You look great in everything! Super jealous! I'm becoming obsessed with that shop! you look absolutely adorable - you look perfectly ready for a hot summer day! love the flower in your hair! i find whenever i put a flower in my hair i am transported to a tropical location!! your printed dress is beautiful, just like the flower in ur hair. I love that your inner hippie comes out in the Summer! I think it makes Summer that much better when your outfit makes you feel carefree! I adore the print on the maxi dress! The flower in the hair is the perfect touch - such a simple outfit for the summer but the details make it special! Love the red flower in the hair! Super cute! Love the flower in your hair. Gorgeous. Beautiful!! Love that maxi dress and the flower in your hair is the perfect touch :) Just started reading Glitter Guide and the site looks great. Beautiful print, colors, and the red flower tops this great outfit off perfectly! I love it. Love your goody table..I'd be afraid to eat any of it, it's just so cute! Taylor, you look amazing! I love that dress!